Healthy Inside ~ Fresh Outside..!! : Can Drinking Too Much Juice With Vitamin C Give You a Kidney Infection? Healthy Inside ~ Fresh Outside..!! 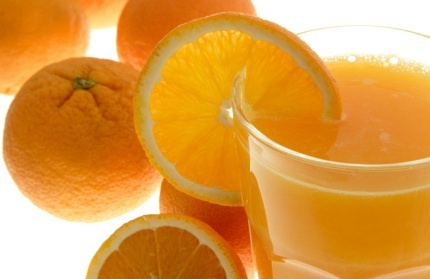 Can Drinking Too Much Juice With Vitamin C Give You a Kidney Infection? Vitamin C is a water-soluble vitamin, so excess amounts normally wash out of the body in urine. But it's possible that consuming too much vitamin C could increase your risk of developing kidney stones. Kidney stones that block the flow of urine could increase your chance of developing a bladder infection, which can spread upward to the kidneys. The vitamin C itself doesn't cause a kidney infection, but the formation of stones might. On the other hand, vitamin C can also decrease bacterial growth in the bladder, decreasing the risk of kidney infection. Most people who overdose on vitamin C get the excess amounts from dietary supplements, not from foods such as juice. The upper daily recommended dose of vitamin C is 2,000 mg. A 3/4-cup serving of orange juice supplies just 75 mg of orange juice, so you'd have to down more than 20 servings per day to exceed 2,000 mg. A study conducted by researchers from the National Institutes of Health and published in the April 1996 "Proceedings of the National Academy of Sciences" found that oxalate excretion, which increases the risk of kidney stone formation, increased when people increased their vitamin C intake from 200 to 1,000 mg per day. Researchers concluded that the upper limit for vitamin C intake should be 1,000 mg per day. Kidney Stones and Oxalate More than 5 percent of Americans have kidney stones, which often cause no symptoms until they move and block vital structures in the urinary tract system, according to the National Institute of Diabetes and Digestive and Kidney Diseases. The most common type of kidney stones contain calcium oxalate crystals that stick together to form stones in some people. Anything that increases oxalate excretion through the kidneys increases the risk of developing kidney stones. Kidney Stones and Infection If a kidney stone blocks the flow of urine out of the kidney, you may develop a kidney infection, sometimes medically termed pyelonephritis. Kidney infections are more serious than their cousins, bladder infections. Symptoms of kidney infection include flank or back pain, fever, chills, lethargy, nausea, vomiting and feeling generally unwell. Elderly people may not have significant symptoms with a kidney infection, delaying diagnosis. If a kidney stone has caused a kidney infection, both the stone and the infection need treatment for the infection to improve. Considerations You would have to drink a very large amount of juice to increase your vitamin C levels enough to increase oxalate in your urine. But if you already have high oxalate levels in your urine or if you have a tendency to develop kidney stones, talk to your doctor about your vitamin C intake. If you're prone to bladder infections, vitamin C in moderation may help prevent them. Vitamin C creates a more acidic environment in the bladder, which inhibits bacteria from clinging to the bladder wall and causing an infection. What Are the Benefits of Grapeseed Supplements? Safflower Oil: Use a Fat to Lose Fat?